This article dives into the Business Rules Engine (BRE) of Oracle SOA Suite and how to create reusable Business Rules for your SOA services and BPM processes. Basic knowledge of the BRE is assumed. In many cases, when you work with SOA or BPM, Business Rules are involved. They are important for decision logic, validations and process routing. The Business Rule Engine (BRE) that comes with Oracle SOA Suite is a logical choice for modelling such Business Rules, but how do you make sure that those rules can be reused over different services and processes? And how do you isolate the Business Rules logic, so you don’t need to redeploy any other components upon changes? In one of my projects, I’ve faced the situation of needing to address these issues and have come up with a flexible solution. This blog is the result of further finetuning of that solution, mainly by using the KISS approach. First things first: let’s talk about the Business Rule Engine. It’s a powerful tool for executing if-then rules or rules in decision tables, but it’s not always too business friendly for modelling. If that’s a major problem for your client, you should consider Oracle Policy Automation instead. However, if you decided to use the BRE, then reusability becomes an issue pretty quickly. It’s very tempting to just create a BPM process and have the Business Rule component generated from there, but then those rules will only be exposed to that particular composite. There is no central repository for reusable Business Rules (like MDS), so your only real option is to put your Business Rules in a separate SOA composite. 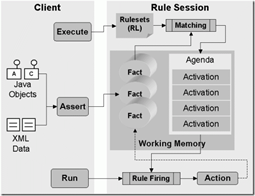 Decision Services are the interfaces of the Business Rule component. One BRE component can have multiple Decision Services and one Decision Service can call multiple RuleSets. RuleSets are groups of rules that can be called by different Decision Services. They should generally contain rules that should always be executed together. Rules are being executed by the BRE. A rule can only exist in the context of one RuleSet, so rules are not reusable on their own. Facts are the input objects for your Rules. Since our objective is to create reusability, I recommend to stick to one input fact, which can then be used by all the Rules. Read the complete article here.